The Government has closed the feed-in tariff scheme for new applicants as of the 1st April 2019, so new installations will no longer be eligible for support from this point onwards. Over the past 8 years, the scheme has been incredibly successful, and resulted in PV on over 750,000 homes. However, as we show below, solar PV is now so cheap, that such policy support it no longer needed, and solar PV remains the cheapest way to supply electricity to a building, even without subsidy. 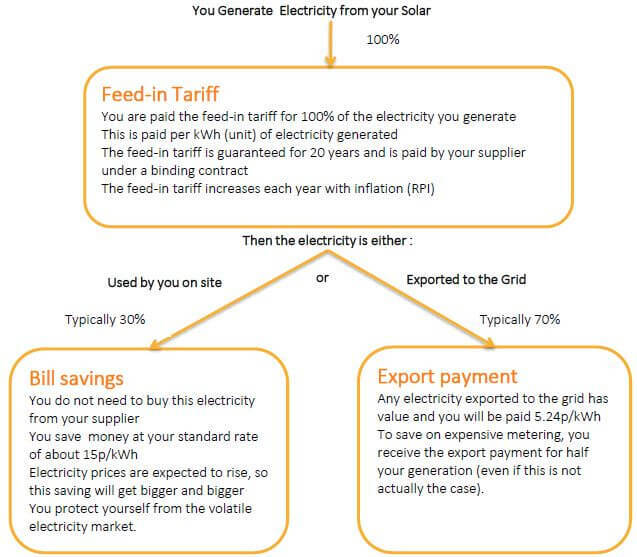 For customers who installed before April 2019, your syetm remains eligible for feed-in tariff payments and you will continue to be paid these by your utility until the end of their 20 year term. Feed-in tariffs are a financial incentive to promote the use of solar PV and other small scale generation technologies such as wind, hydro and anaerobic digestion. They provide a premium payment to householders and businesses for every unit of green electricity generated. They provide an additional income stream for 20 years, and thereby improve the case for investment in these technologies. Bill savings. When you generate your own electricity, you do not need to purchase that electricity from your electricity supplier anymore. Any electricity you generate and use yourself, will save households approximately 15p/kWh (8-12p/kWh for businesses). Feed-in tariff. The feed-in tariff payment is paid for every unit of electricity generated. For households this is 4p/kWh, with smaller payments made to larger scale systems on commercial rooftops. Exported electricity. You will also receive a payment of 5.24p/kWh for electricity exported back to the grid. For systems less than 30kw, the amount of electricity is too small to be worth metering. Here payments are ‘deemed’ rather than measured – it is assumed that you will export 50% of the electricity generated, and you are paid on this basis, irrespective of how much you actually export. Feed-in tariff payments have been declared until the end of March 2019. The rates (p/kWh) at different sizes are shown below. Historically, residential systems tended to be limited at 4kW in size, but now the residential tariff band runs from 0-10kW, there is now no financial reason for this to be the case. It now makes sense to completely fill all available roof space. Systems above 4kW may need a grid connection application to be submitted, and this is something we can do on your behalf. In order to be eligible for the highest rate of feed-in tariff, your building will need to meet a minimum level of energy efficiency. There is no point putting solar PV up on a building that is not energy efficient. You will need an Energy Performance Certificate (EPC), which rates the energy performance of your building from A-G. You will need to reach level D or above to qualify for the highest rate of feed-in tariff. We can commission these on your behalf as part of our project management of your installation. Feed-in tariffs are paid through electricity suppliers. You will need to sign up with an electricity supplier to receive your FiT payments. This does not have to be the same company that supplies your electricity, but in most cases people choose to use the same company. In order to sign up, you will need to download a FIT registration form from your supplier website. We will provide you with your MCS certificate as part of the commissioning process, and a full receipt for to prove you have purchased this system. You will need these in order to get registered, and we are happy to help you with any questions you may have along the way. Your supplier will ask you to submit your generation meter readings on a quarterly basis, and they will pay directly into your bank account. How important are feed-in tariffs? Over the lifetime of the system, solar PV is already the cheapest way of providing electricity to households and businesses. As we note above, the majority of the benefits of a PV system come from not having to purchase expensive grid electricity from your supplier anymore. Because the bill savings are greater than the payments you receive from exported electricity, the economics for solar PV works best when a high percentage of electricity can be used on site. For this reason we are seeing householders becoming increasingly interested in adding battery storage to their PV systems. For businesses, where daytime loads are high, it is possible to get very high levels of self-consumption of solar electricity – even 100% in some cases. These systems give the very best economics of solar power, with rates of return on investment between 15 and 20% per year. What happens to feed-in tariffs in April 2019? Feed-in tariff rates have been announced until the end of March 2019, but it is likely that they will disappear completely at this point, and solar PV will be a ‘subsidy free’ technology. There is a possibility that FiTs may be replaced by something else, but Brexit is proving a distraction for Government departments, and we are still awaiting a Government consultation on this issue. The consequences of this are two-fold. Even without subsidy, solar PV will remain the cheapest way of providing electricity to a building, and commercial premises in particular will have excellent economics. Indeed we have already installed 168kW of subsidy free solar for the University of Reading. Changes to tariffs always gets media headlines, but tend to ignore the fact that the main benefit of solar PV – avoided imports – will always still be there. However, if you wish to give the economics of your potential project a little boost, it would be wise to make sure this is fully installed and commissioned by March 31st 2019.